Dr. Gerhard Bauer designed and heads the Good Manufacturing Practice Lab. Dr. Jan Nolta is a whirlwind of energy, and this July morning she is blitzing through UC Davis’ brand-new Institute for Regenerative Cures, a state-of-the-art lab where scientists and researchers are working on breakthrough discoveries and stem cell therapies. “This lab, to me, is somewhat mind-blowing,” Nolta says as she moves from one area of the lab to another. Nolta heads the stem cell program at the UC Davis School of Medicine and directs the Institute for Regenerative Cures, a $62 million superlab that opened in March. The lab was once a rickety building on Stockton Boulevard that was part of the old California State Fairgrounds, but the renovation transformed it into a hotbed of research where more than 20 senior scientists work with 115 researchers and technicians on stem cell therapies and treatments for Huntington’s disease, vision loss and repairing tissue damaged in heart attacks, among other ailments. The new building allows for easier collaboration between scientists and doctors, who now have a home base to create research partnerships. For example, stem cell researchers have been working with vascular surgeons to develop treatments for certain types of artery disease. The surgeons bring their bedside experience to the table, while researchers bring experience in lab and research protocols. Perhaps the crown jewel of the institute is its Good Manufacturing Practice Lab, a 7,000-square-foot custom-designed space to turn stem cells into clinical-grade therapies. The new building allows for easier collaboration between scientists and doctors, who now have a home base to create research partnerships. Picture a hypersterile lab with air locks and special pressure settings to keep air pure and clean. There is only one way in and one way out. Scientists have to “gown up” in a way that makes them look like they belong in a science fiction movie just to get into the lab. The air is tested daily to ensure everything is sterile and pure. This lab looks futuristic and comes with some of the most advanced equipment needed to turn stem cell research into real remedies for patients. It’s the only academic lab of its kind in the area, and it is quickly gaining international interest for its custom design. The mastermind behind the Good Manufacturing Practice Lab is Dr. Gerhard Bauer, who designed and heads the lab. An assistant professor of hematology and oncology, Bauer has spent the past 15 years perfecting the design concepts for the lab. He’s thought about every detail necessary to keep stem cell samples pure and clean — and it shows. Ask him about air pressure, and he’ll go on and on (in a good way) about all of the details needed to keep air in the Good Manufacturing Practice Lab uncontaminated. It’s complicated. Neither the air cycling out nor the air cycling in can be contaminated. Because it’s the largest academic lab of its kind in Northern California, the Good Manufacturing Practice Lab has drawn interest from researchers across the state who want to use it to get stem cell therapies out of the lab and into hospitals. The lab is already partnering with researchers from Stanford University who are developing a gene therapy cure for Epidermolysis Bullosa, a skin tissue disease that essentially creates blisters and burns between two layers of skin, often because of minor injuries. Eventually, the skin falls off. Children with Epidermolysis Bullosa are often called butterfly children because their skin is as fragile as a butterfly’s wings. Dr. Jan Nolta heads he stem cell program for the UC Davis Health System and directs the Institute for Regenerative Cures. “We’re going to correct the cell,” Bauer says. And it’s all because of the Good Manufacturing Practice Lab. Skin is hot right now in the UC Davis Stem Cell Program. Nolta says researchers are developing biological bandages made out of decellularized pig intestine — meaning the cells are stripped from the tissue — which could then be used to cure open sores and ulcers. “There is really a lot going on here on the skin front,” she says. And on a number of other fronts, as well. Disease teams are chasing down gene therapies for such ailments as hearing loss, bladder disease, osteoporosis, heart disease and HIV. U.S. News and World Report recently ranked UC Davis Medical Center among the top 50 hospitals in America? 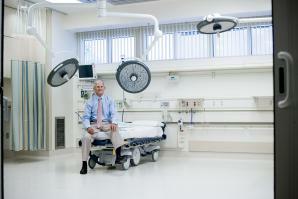 The nationwide survey of 5,000 hospitals ranked UC Davis Medical Center No. 35 for orthopedics and No. 50 for cancer. The report published last month showed that UC Davis Medical Center’s nurse-to-patient ratio of 2.8 is among the highest in the nation. In cancer, only the Mayo Clinic had a higher nurse-to-patient ratio, with three nurses per bed. In orthopedics, only Mayo and Abbot Northwestern Hospital in Minneapolis had higher ratios, both with three nurses per bed. Additionally, only two other Northern California hospitals ranked in the top 50 for cancer: the University of California, San Francisco Medical Center and Stanford Hospital and Clinics. And only three other Northern California hospitals ranked in the top 50 for orthopaedics: UCSF Medical Center, Stanford Hospital and Clinics and John Muir Medical Center in Walnut Creek. Over the course of his lengthy career as an orthopedic surgeon, Dr. Michael Chapman transformed trauma care in the Sacramento area, saving countless lives along the way. The team at Davis-based Gold Standard Diagnostics Inc., which sells disease test kits, automated instruments and regulatory services, noticed an opportunity in the medical laboratory industry to build an instrument that would automate not only the test kits it was offering, but those of other suppliers as well, allowing labs to consolidate to one instrument and improve efficiency, says John Griffiths, chief executive officer.